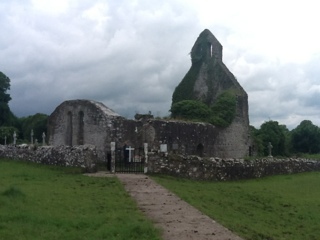 First we checked out the local Cisterian Abbey here before we set sail. I also took some pics of some unique carvings there and will add a pic or two here in due course. 10:40 am, Roy, our incredible lock keeper was again our incredible lock keeper through this day too. We started to wonder if his name was Roy followed by the initials A L.
... but the day's forecast was telling us of something completely different. 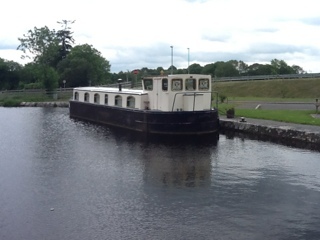 The next lock, 40, was several kilometres away so we could relax and cruise. This section of the canal was more like a river, curving through the countryside rather than long straight stretches serving us different scenery around every bend. We passed small native woodland coppices, cattle and sheep pastures, bogland and some that seemed like manicured park land. 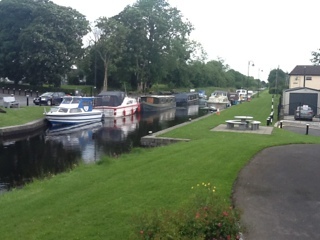 On the way to Lock 40 we passed by the very pleasant Ballybrannigan Harbour near Ballymahon, which looked like it was once a very important canal trading post. 11:40 am, at Lock 40, Mullawarnia, the sun went away and it started raining. 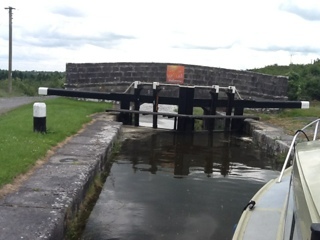 Fiogha Bridge, not far from this lock, is a very pretty well kept area, but we did not stop as now Cloondara was in our sights for reaching today. 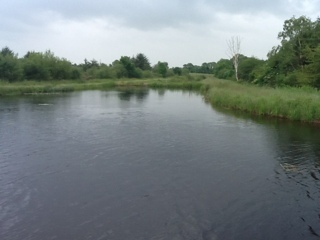 From here John Roche wrote, "Westwards to the Shannon past Mosstown with its rich woods and immense ferns growing down to the water's edge, almost tropical in their combined luxuriance. past ripening corn fields, and new mown hay, through bogland redolent with the scent of heather and the tang of drying peat, the brown earth and the purple plants throwinf up deep vivid shades of under the evening sun"
Unfortunately, I did not get to speak to them as the boat needed some serious weed clearance while we were in the quiet of the lock. This weed clogging was now surprising as today had served us the cleanest canal water so far on our entire adventure. 2:20 pm were were well on our way again passing several abundant hay meadows where John Roche had reported there being corn and grain fields. 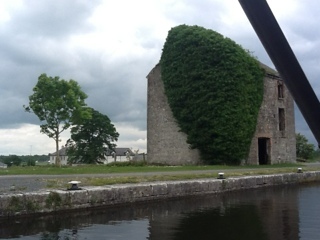 We later discovered and photographed a mill in Cloondara where all of this grain was once barged to. At this point were were feeling that our beautiful, and sometime challenging, Royal Canal adventure was about to be completed. 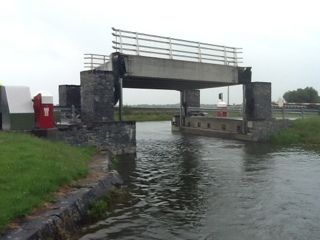 Just three more downhill locks to go before we would be back on the Shannon River. 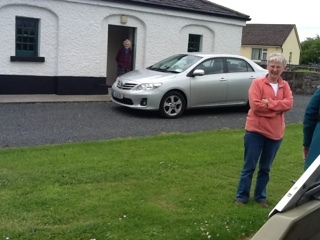 John Roche seemed to have write this here, "We are told that Clondara on the Shannon is only three miles away. Greatly excited, the youngsters perch on the highest part of the boat to strain their eyes (watching for the Shannon)"
4:10 pm, we enjoyed some excitement cruising under the Begnagh Bridge lifting bridge that greeted us with a surprising large digital revolving sign telling us what to do. There was a smug sense of power as we sailed under and looked at a small queue of traffic waiting for us to pass. So, of course, with Claire at the helm at this point slowly passed under for safety reasons :-). Maybe it was past Begnagh Bridge when John Roche's children called out "At last a shout, and there is a thin ribbon of blue flashing in the sunrays. 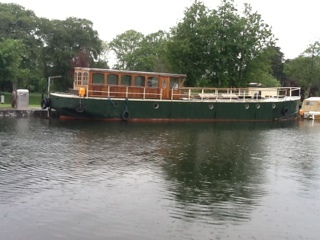 Tomorrow we shall float on the waters of the lordly Shannon"
4:30 pm we arrived at lock 45, the lock letting us into Cloondara's Richmond Harbour at the end of the line. 4:50 pm, the clogging weed had been cleared quickly. 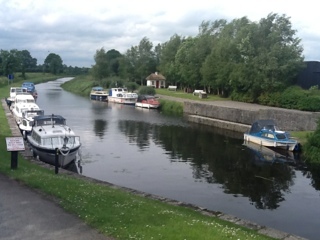 If this had not happened our intent was to go through Lock 46, out of the Royal Canal completely, into the Camlin River section and out into the River Shannon. The combination of this weed incident, along with the growing wind and rain caused us to re-think this idea. We moored up 100 yards from Lock 46, the final lock and exit from this canal. Rambler was here too, so the crew did not sail her through the night to Shannon Harbour? There are plenty of good boater's facilities here, and working. Nothing closed here due to health and safety issues. 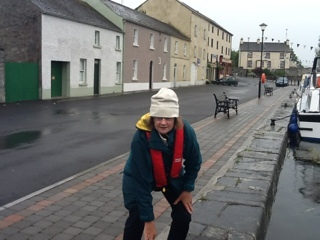 Despite the wind and rain, Claire and I investigated the end of the Royal Canal, the pretty stretch of the River Camlin, and where this meets the big wide Shannon River. Back at the boat we checked the weather forecast. The next day forecast was not good, and the oncoming night forecast even worse. However, we were very eager to finish this complete adventure by Saturday evening at Shannon Harbour, to complete the triangle. Apparently very few have accomplished this completely due to the constant challenges of section clusures in Dublin, Mullingar and from Longford to here at Cloondara. Add to that the awful weed choking challenges along the Grand Canal.